Color Available: Red, Yellow, Green, Blue, etc. As a reputed organization, we are engaged in offering an extensive range of D Cut Non Woven Bag to meet the needs of our customers. This bag is light in weight and can bear heavy load at ease. 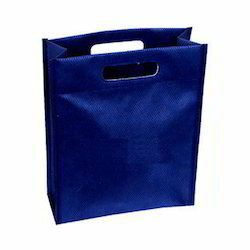 Made up of high quality base material, this D Cut Non Woven Bag is available in different sizes, colours and finishing. As a formidable firm in packaging industry, we are considered as the remarkable manufacturer, exporter and supplier of Printed Non Woven D Cut Carry Bag. Under the strict vigilance of our adroit professionals, the provided bags are designed and stitched using optimum quality raw materials with the aid of ultramodern techniques. In order to keep pace with the never ending demands of customers, we are involved into offering wide range of Non Woven D Cut Bag.